Proposals to build an airport in the Thames Estuary airport were called both “preposterous” and essential in a debate between two South East MPs. Rochester and Strood MP Mark Reckless said plans for an estuary airport were outdated during a parliamentary debate on UK aviation. Mayor of London Boris Johnson favours the idea of an airport on an artificial islnd, known as “Boris Island”. His brother, Orpington MP Jo Johnson, said the extra capacity was essential. During the debate about the future of aviation in the UK, Mr Reckless said: “I think there’s a very strong case for Gatwick. I think many regional airports can help with the load. In 2002, a new airport at Cliffe on the Hoo peninsula was one of several options being considered by the Labour government for airport expansion in the South East. However, in December 2003, it decided to leave Cliffe out of its airport expansion plans. Jo Johnson replied: “I’m a bit depressed by the combination of nimbyism and sticking-plaster solutions that he’s putting forward. 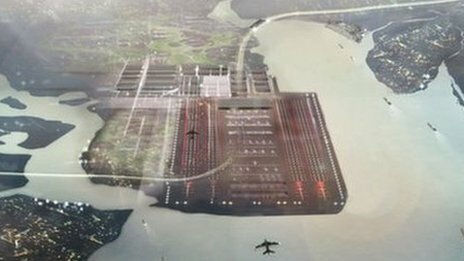 Two plans have been put forward for Thames estuary airports – one on an artificial island, known as “Boris Island”, and another on the Isle of Grain proposed by architect Norman Foster. On Sunday, a report, commissioned by the South East Local Enterprise Partnership (LEP), said an estuary airport would be too expensive and would take too long. It recommended expanding other airports such as Gatwick and Heathrow to meet increasing air travel demands. Birmingham Airport recently urged the government to do more to promote regional airports across the country rather than a hub airport in the South East. The government will begin a consultation later this summer on a document setting out aviation strategy. It was encouraging, for those against an estuary airport, that there was a lack of conviction behind any suggestion of an estuary airport scheme. But it was less encouraging that a number of speakers appeared to have been taken in by BA and BAA lobbying for greater airport capacity. It wasn’t until Dr Julian Hubbard MP spoke, at around 56.30, that it was explained that the 7 runways in 6 airports around London make our capital the best connected city in the EU, possibly the world. It was also explained that if the government’s carbon targets are to be achieved, capacity must be capped at 368 MPPA by 2050 – and the UK has capacity for that now. This being a parliamentary debate there was a real knock around between Labour and other MPs, which begins at around 1.10.00. The response by the Secretary of State, Theresa Villiers, at the end, is worth looking at. (at 1.20.43 on the recording above). I congratulate my hon. Friend on securing this debate, but I am a bit depressed by the combination of nimbyism and sticking-plaster solutions that he puts forward. Is he aware that the UK remains without any direct connection to 11 cities in mainland China that are expected to be among the 25 biggest cities in the world by 2025? Only a hub airport can deliver the sort of connectivity for which businesses in Orpington, and doubtless in my hon. Friend’s constituency, are crying out. I encourage my hon. Friend to listen to the rest of my speech, and not merely to recycle briefings that I, too, have received. There are many arguments for a hub airport, and I do not deny that some are valid. Many, however, are recycled by industry players with strong vested interests that are not necessarily those of the country as a whole. However, I will address my hon. Friend’s point later in my remarks. Boris tells us that that money will come from private investors. Yes, but they will want a return. Even if we are looking at a 5% interest rate over a 50-year period, a return on that sort of money will add at least £50 to the cost of every plane ticket from the airport. Why would airlines, passengers, the Government, indeed anyone, want to pay that sort of money when the cost of expanding existing airports—including some that Members present may be promoting—is so much smaller? The coalition Government were right to reverse the policy that the previous Government decided on in 2003. To recap, the then Government’s recommendation was a second runway at Stansted by 2011-12, a third runway at Heathrow by 2015 to 2020 and, following our judicial review, a second runway at Gatwick from the mid-2020s. The strongest reason why we were right to overturn that is that the projections on which theLabour Government operated from 2003 were, as I and many others set out clearly at the time, wholly unrealistic. They were based on a low case of 400 million passenger movements for the UK by 2030, and a high case of 600 million. In deference to my hon. Friend, I shall bring forward my remarks on that point. Before my hon. Friend does so, will he say if he welcomes the fact that Heathrow delivers more flights to China than any of its continental rivals, meaning that we have excellent connectivity to important emerging markets such as China? Yes, I hugely welcome that. From listening to the debate that is dominated by a small number of players with the strongest vested interests and the most public relations consultants, one would get almost the reverse impression. When we talk about flights to China, it is important to remember that the reason why we have relatively few different city destinations—that is separate from the overall number of flights, which the Minister was right to raise and I think is more important—is that it is for the convenience of British Airways, the dominant player at Heathrow, to use Hong Kong as a hub airport for China, in exactly the way that it uses Heathrow as a hub here, through the Oneworld alliance and Cathay Pacific. First, on a point of fact, according to BAA, London has only 31 flights a week to two destinations in mainland China, whereas there are 56 to three such cities from Paris Charles de Gaulle airport, and 51 to four such cities from Frankfurt. Furthermore, my hon. Friend references Hong Kong and Shanghai. Surely he is aware of the additional cost that comes from having to route products, goods and services through Shanghai and Hong Kong, as opposed to sending them directly to where the market is, in mainland China. Our businesses are crying out for connectivity. That is an obstacle. Hong Kong is a transhipment point. If my hon. Friend would like to see more flights to more Chinese cities, the way to do it is to rip up that treaty, and for the UK to move to a unilateral open-skies position that allows any Chinese airline to fly to any city in the UK. I am trying to work through the maze of complicated arguments that my hon. Friend is presenting, but I have just a simple question. Does he believe that the United Kingdom as a whole needs more aviation capacity? There is an argument about competitiveness, and that argument is for today. Our colleagues are arguing that businesses in their constituencies require the opportunities now. Therefore we should be making the most of our existing airports, rather than waiting two decades for a new airport to be built to maximise opportunities. I agree. There is huge scope for what my hon. Friend describes. It would hugely benefit not just the Medway towns and the south-east region, but the country as a whole. The reason is that we have a bilateral treaty with Brazil, with a current limit of 35 passenger services a week between the two countries. Again, that is vastly to the benefit of BA, which routes flights to Latin America, including Brazil in particular, through the joint hub that it now has in Madrid, through Iberia following the merger. We do not get pressure from BA to change that, because it hugely benefits its profits, but BA’s market capitalisation is in the low billions. The idea that our whole airline policy and the network of treaties negotiated by the previous Government should restrict those flights and prevent Brazilian or Chinese airlines from flying into our large cities is a huge mistake. Even if we were to rip up every treaty that my hon. Friend has identified as a block, does he seriously believe that there is sufficient capacity at our hub airport? Will a hub airport alone sustain newly developing point-to-point routes? Does he seriously argue that Heathrow could suddenly accommodate more routes to developing countries? our country as a whole, within the existing constraints of Heathrow—of course, others will argue that it needs to be bigger or we need a hub somewhere else and so on—European legislation prevents us from having that. Anyone who wants to set up a marginal route to an emerging market needs to buy out, at vast expense, one of the existing airlines, particularly BA, which has a near monopoly power. They have to give BA a huge amount of money to take the slots they need for those routes. The reason why they cannot do that is cost, yet we have treaties that restrict the amount of access that overseas airlines have into the UK. They could otherwise be flying into Gatwick, Stansted or Birmingham as city pairs, but the routes and slots are at Heathrow, and the regulation creates that monopoly power. Is my hon. Friend seriously suggesting that the key to our aviation problems is ripping up the treaty of Rome? It would certainly help. There are other ways in which the issue could be addressed; for instance, the air passenger duty regime. Many lobbyists are against the size of air passenger duty, but in operating conditions where there is an almost perfect monopoly at Heathrow and, at peak and to an extent shoulder periods, a monopoly at Gatwick, what happens through the increase in air passenger duty is that some of the monopolised value of those slots and the power of the grandfather rights are given instead to the public purse. It is not a situation of perfect competition in which costs are passed on. To the extent that costs rise, whether they are landing fees or APD, that will largely be absorbed into the price, giving greater public benefit, and possibly driving some of the marginal leisure stuff out of Heathrow and Gatwick. Posted: Thursday, July 5th, 2012. Filed in News about Airports, Recent News.